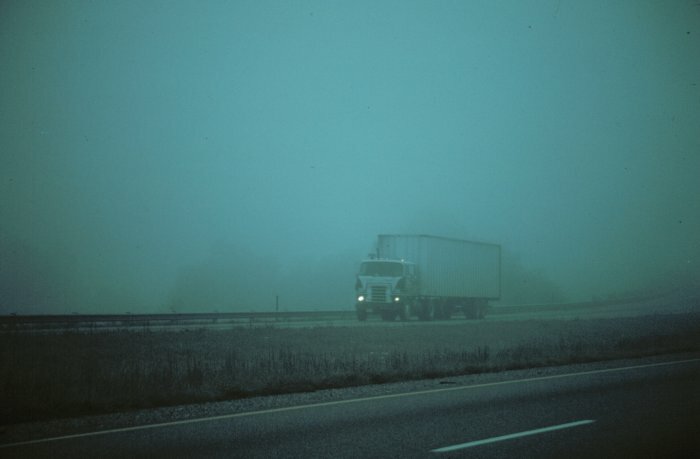 Fog can be considered a cloud at ground level. The processes forming it, however, are usually different from those that form clouds. Like clouds, fog is made up of condensed water droplets which are the result of the air being cooled to the point (actually, the dewpoint) where it can no longer hold all of the water vapor it contains. For clouds, that cooling is almost always the result of rising of air, which cools from expansion. But for fog, which occurs next to the ground, there are usually other reasons for this cooling. For instance, rain can cool and moisten the air near the surface until fog forms. Or, as is more often the case, infrared cooling of a cloud-free, humid air mass at night can lead to fog formation - this is called "radiation fog". Radiation fog is most common in the fall, when nights get longer, airmasses begin to cool, and land and water surfaces that have warmed up during the summer are still evaporating alot of water into the atmosphere. Finally, a warm moist air mass blowing over a cold surface (usually snow or ice, or over a cold ocean surface) can also cause fog to form-this is called "advection fog". FOG: A FAST WAY TO MELT SNOW: In the spring, snowcover can melt rapidly if a warm, humid air mass overrides the snow and the snow then lowers the temperature of this humid air to the point that fog forms. The fog droplets forming at the snow surface release the latent heat of condensation, which helps to melt the snow.